Stella Jones will be performing many concerts in 2019. 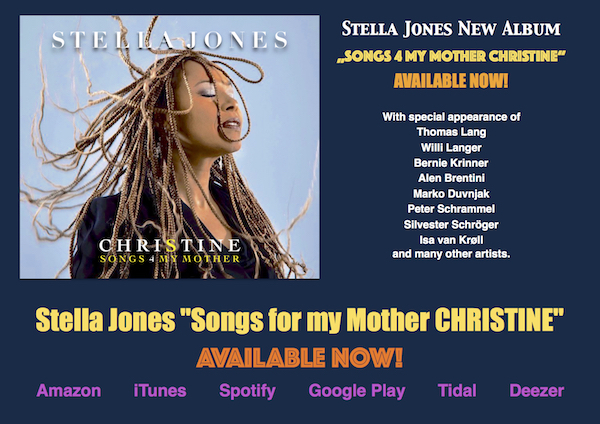 Stella Jones NEW ALBUM OUT NOW! AVAILABLE AT ALL ONLINE STORES NOW. This new album was produced over many months at several studios across the world. 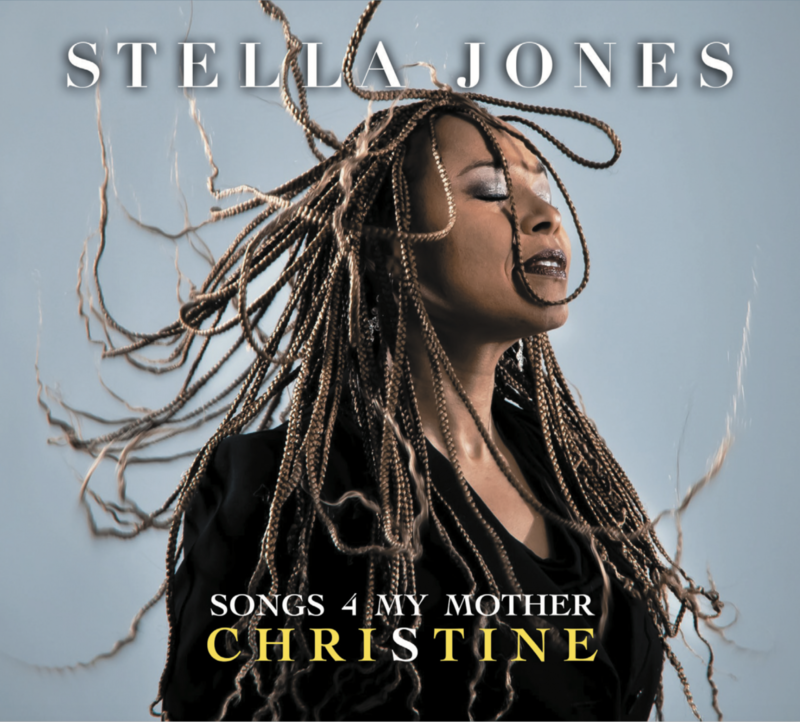 The singer and producer Stella Jones composed all of the songs and dedicated her music to her Mother who passed away in 2017. The music is an combination of Jazz, Nu Soul, RnB, Hip Hop and Rock with high listed international musicians from all over the world. Stella created a mix of high energy funk, fusion, jazz music and mixed the songs with elements of progressive rock. Stella Jones new album „Songs for my Mother CHRISTINE“, is sparkling with self-confidence and a seemingly irrepressible energy. In the twelve original compositions, she combines earthy blues, american-groovy R’n’B, jazz, hip- hop, nu-soul elements and Cuban rhythms with european songwriting in an amazingly innovative way, creating a unique musical album. For the album „Songs for my Mother CHRISTINE“ she got top-class international musicians, including US based drummer Thomas Lang who is touring with Stars like Geri Halliwell, 911, B * Witched, Ozzy Osborne, Sugababes, Robbie Williams and Bonnie Tyler. The Austrian bassist Willi Langer, who among others is working with Gloria Gaynor, Rainhard Fendrich, The Supremes, Tina Turner, Thomas D and Count Basic also played several tunes on this album and his Funk & Soul touch gives the music a special flavour. The well known Austrian based guitar player Bernie Krinner (collaboration with Anna Fay, Carl Avory, John Whitfield, etc.) designed several songs with his rhythmic funk beats. Rijeka based guitarist Alen Brentini (working with Kee Marcello, Richie Kotzen, Marco Mendoza, Mike Terrana, Michael T Ross, Michael Voss, etc.) played two exeptional impressive solos for the songs „Electricity“ and „Reluctant Child“. The croatian drummer Marko Duvnjak, who lives in Zagreb and works for well-known TV show formats such as „RTL“, „Croatia’s Got Talent“ and well-known artists such as Claudia Beni and Andreas Gabalier, also took place as special guest on the titles „Crazy People“ and „Summer Breeze“ with impressive rhythms, as well as the well-known jazz percussionist Silvester „Jakschi“ Schröger from Salzburg, who is not only a close friend of the family, but shaped the jazz and rock scene in the 70s and 80s in Austria. Furthermore, Cuban singer Isa van Krøll is featured in the title „The Bridge“ with her expressive solo voice and Stella’s stepfather Peter Schrammel, who is a true descendant of the Austrian Schrammel Dynasty, contributed the intro to the song „The Bridge“, which was recorded in the studio of Producer Terry Chladt. Stellas daughters contributed with percussion and vocal parts and the cover photo for the album was made by the young exceptional artist Elena Shirin.